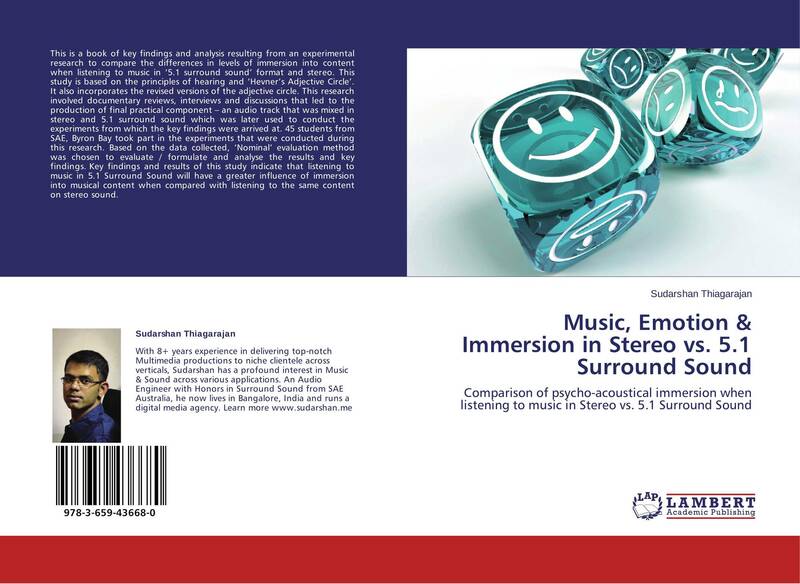 This is a book of key findings and analysis resulting from an experimental research to compare the differences in levels of immersion into content when listening to music in ‘5.1 surround sound’ format and stereo. This study is based on the principles of hearing and ‘Hevner’s Adjective Circle’. It also incorporates the revised versions of the adjective circle. This research involved documentary reviews, interviews and discussions that led to the production of final practical component – an audio track that was mixed in stereo and 5.1 surround sound which was later used to conduct the experiments from which the key findings were arrived at. 45 students from SAE, Byron Bay took part in the experiments that were conducted during this research. Based on the data collected, ‘Nominal’ evaluation method was chosen to evaluate / formulate and analyse the results and key findings. 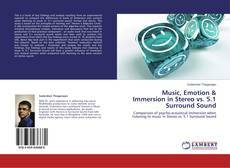 Key findings and results of this study indicate that listening to music in 5.1 Surround Sound will have a greater influence of immersion into musical content when compared with listening to the same content on stereo sound.